The reverberation of the ‘Lex Infinitum 2019’ hosted by V.M. Salgaocar College Of Law (VMSCL) in collaboration with Global Resolution Organisation (GRO), USA referred as “VMSCL – GRO International Dispute Resolution Competition” exhibited an awe inspiring valedictory ceremony at Nanu Beach Resort, Betalbatim. 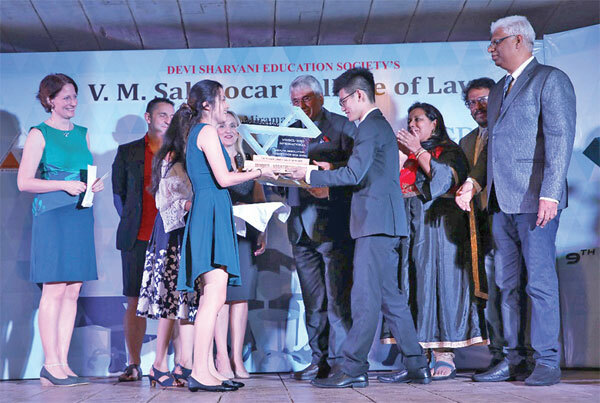 The Four Days unique event which was an amalgamation of scholastic and vibrant global talent scheduled from January 9 to 12 saw the closing ceremony on 12thin the distinguished presence of Senior Advocate Surendra G. Desai as the chief guest for the splendid evening. Dr. Sandhya Ram gave a welcome note to the august gathering comprising of 24 teams, National and International Experts, Delegates, Lawyers, students and faculty of VMSCL and V.M. Salgaocar Institute of International Hospitality Education (VMSIIHE). Surendra G. Desai appreciated the initiative of VMSCL in propagating the concept of Alternate Dispute Resolution (ADR) Mechanism not only in India but across the globe. In his address he expressed that “finally disputes between the litigants mandatorily have to be resolved. Options available to the litigants are stepping in the courts or ADR”. Praising the organising team of the event he added that “if discourse can be resolved through an agreement there is solace in one’s life and that is the ultimate treasure”. Xreya Arur, then presented a report of the untiring endeavors and preparations that commenced months ago which lead to the successful journey of the triumphant event. The participants were impatient and anxious to listen to the final result. The best negotiating team was bagged by the National University of Singapore. The runners up for best negotiation team were GLC, Mumbai. The Best mediator award was bagged by Jagiellonian University Poland and the 2ndplace awardee was School of Law, Christ University. Finally vote of thanks was proposed by Dr. M.R.K. Prasad, Principal of VMSCL. Expressing deep sense of gratitude towards the organizing team of VMSCL and for the awesome hospitality provided by VMSIIHE, Ms. Kimberley Schreiber, President GRO, USA congratulated the participants for their overwhelming performance at the competition rounds. Phiroze Loran was the master of the ceremony. The audience expressed their desire to look forward to the thrilling competition in the coming years.